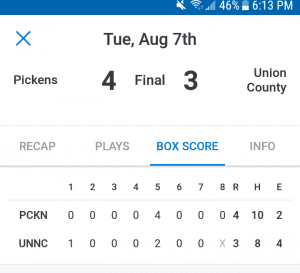 After a loss in the season opener to Lumpkin Co., Pickens softball traveled to the home of the Panthers in Union Co. on Tuesday and earned the victory in the late innings. 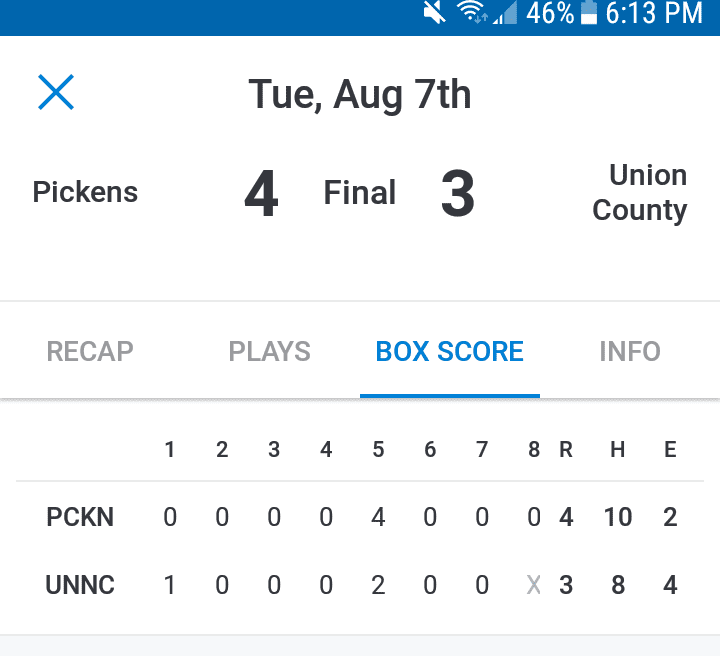 With the Panthers striking for one in the bottom of the first it would have been easy for the Dragonettes to remember just one day before where their opponent had started the game in the same fashion. As the game moved through the next few innings remaining at 1-0, it wasn’t until the top of the fifth that the PHS bats came alive. 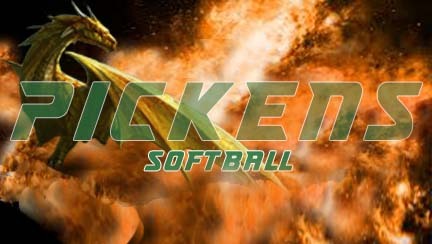 Pickens put 4 runs on the board by way of 5 hits, 2 fielder’s choice and a hit batsman plating Zoe Morgan,Allie Tlacil, Sarah Morris and Chloe McPhersone. Pickens fifth inning came to close leaving 2 runners on base after a fly out by Charley Hulsey. These four runs and a great pitching performance by Sarah Morris proved to be enough to keep the win. Morris was in the circle for all seven innings allowing 3 runs all earned on 8 hits 1 hit by pitch and 5 strikeouts. 119 pitches were thrown by Morris with 73 being strikes. This win brings the Dragonettes back to 1-1 in the 2018 season with still a long season ahead. Next up for Pickens will be August 16th at home as they welcome in Lafayette. 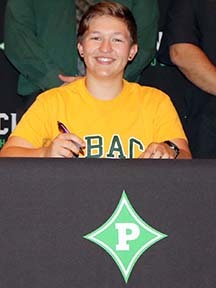 Monday May 21st was an exciting day for outgoing senior Lizzie Haughwout and her teammates of Pickens High School Soccer. 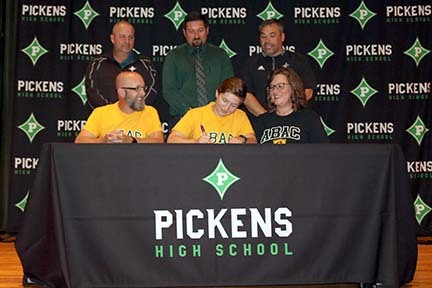 Haughwout put the pen to paper and signed her National Letter of Intent to lace up her cleats and play soccer for Coach Alizira Sisman and the Fillies of ABAC(Abraham Balwin Agricultural College). Haughwout has played soccer from a young age starting in youth leagues, through middle school and the last four years as a Dragon. She plays probably the toughest position on the field. The Goalkeeper doesn’t like to do a lot but when they do it is physical and their focus has to be spot on.. Lizzie is coming off an injury to her labrum in her right shoulder but is expected to fully recover and get back in the keepers box soon. Haughwout will be an excellent fit for the Fillies both on and off the field. She will major in Pre-Veterinarian studies and plans to get her degree and become a fully licensed Vet after ABAC. Best of luck to Lizzie Haughwout at ABAC and in her future beyond college. 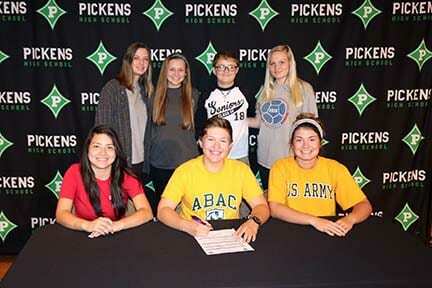 A great year for PHS Athletics continued this morning as Pickens Dragons soccer player Adam Leicht signed a soccer scholarship with the Emory-Oxford Eagles. 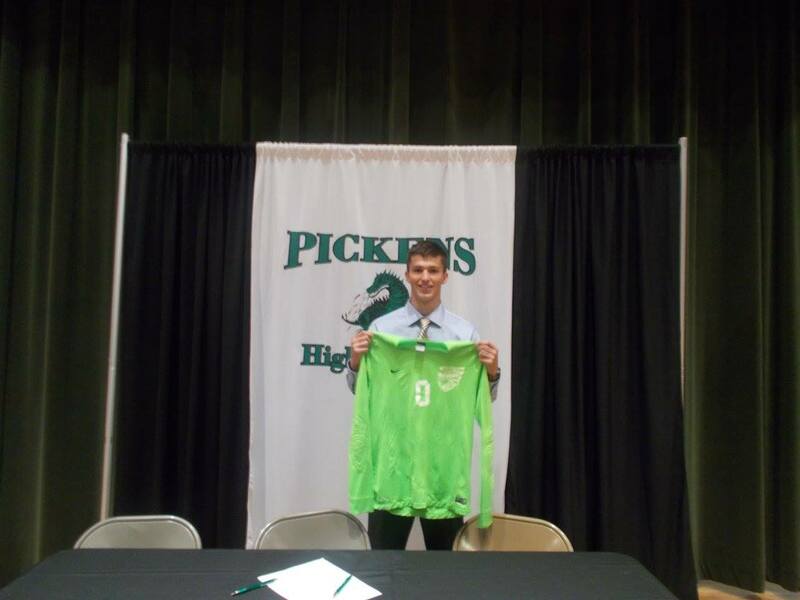 The senior goalie holds a couple of records during his time at PHS and is looking forward to continuing his career at the next level. It was great. I worked so hard for this moment and I mean it’s crazy that it’s all come down to this, but it couldn’t of happened without the people in this community supporting me. Coach Moss-Brown (head coach) was actually one of the first coaches that reached out to me. Playing for a coach with professional soccer experience is a great opprotunity and to go to such a great academic school. It will definitely be very cool. Its something that i’m not used to, but I think it’ll help me expand and get to know other people as well. As an athlete give my best, give myself and the team every single game, help us win games. As a student, a high g.p.a and hopefully that’ll open a lot of doors for graduate school and things like that. Congratulations to Adam and good luck at Emory-Oxford.